Looking to start a rental property website on WordPress? No matter If you are a seasoned property manager with years under your belt or just starting out, it’s a pretty doable task. Of course, we’re not trying to say it’s a cinch! However, a bit of determination will take you to a fully-functional rental property website even without tech expertise. First things first, you have a chance to use WordPress as a cost-effective content management system to showcase your rental units, however, integrate an accommodation reservation software via proprietary specialist tools (normally cloud-based). The main advantage of them is that… they just do the job as purpose-oriented engines for direct website bookings! However, they may cost an arm and a leg with all those per-booking or per-rental commissions. But that’s another story. 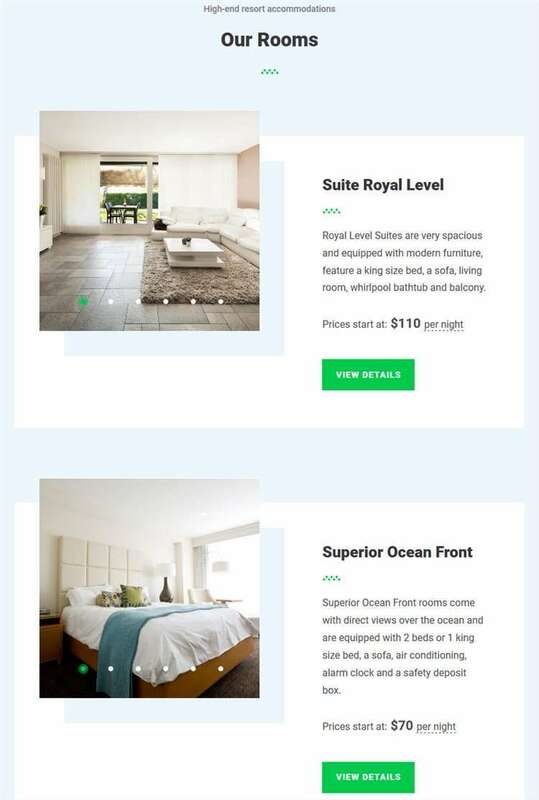 In our tutorial, we are going to show a different approach: how to build a vacation rental or hotel WordPress website and, moreover, host all your accommodations, reservations, billings data and more under one roof, with a micro-niche WordPress Hotel Booking plugin by MotoPress. It’s one of the most used WordPress booking plugins that offers conformance to the realities of the lodging business. In a nutshell, this plugin allows to list unlimited rental units and take unlimited bookings through the website, without extra commission. It’s suitable for both long and short-term rentals: inns, cabins, villas, hotels, bed and breakfasts, you name it. Let’s assume you’ve already managed all the hosting and WordPress installation things so we can move forward. We’ll show a brief overview of steps of how to work with the plugin. We hope it’ll help you get the idea of what the process looks like and whether the functionality suits your needs perfectly. 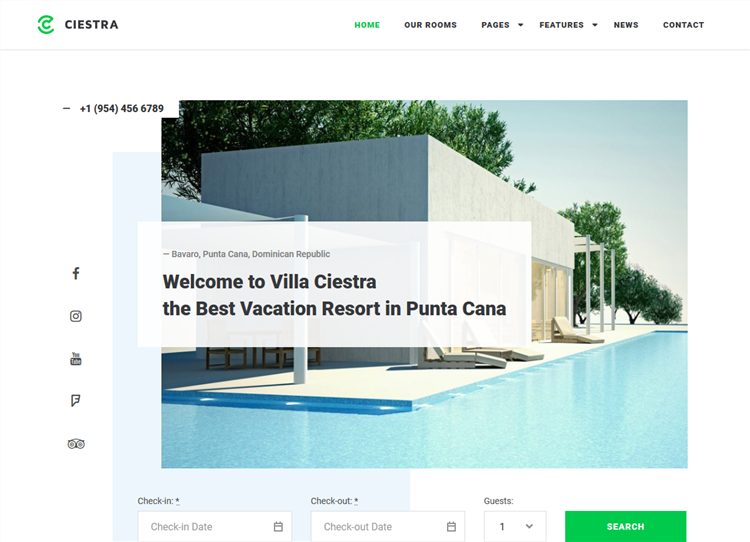 To show you some examples, we’ll be using the Ciestra WordPress resort theme, which is a perfect match for hotels, serviced apartments and other lodgings. It’s a great lightweight theme designed with Elementor, which will let you customize it without much fuss. By the way, this theme comes with the MotoPress Hotel Booking plugin without extra cost since it belongs to the collection of MotoPress custom-crafted themes. 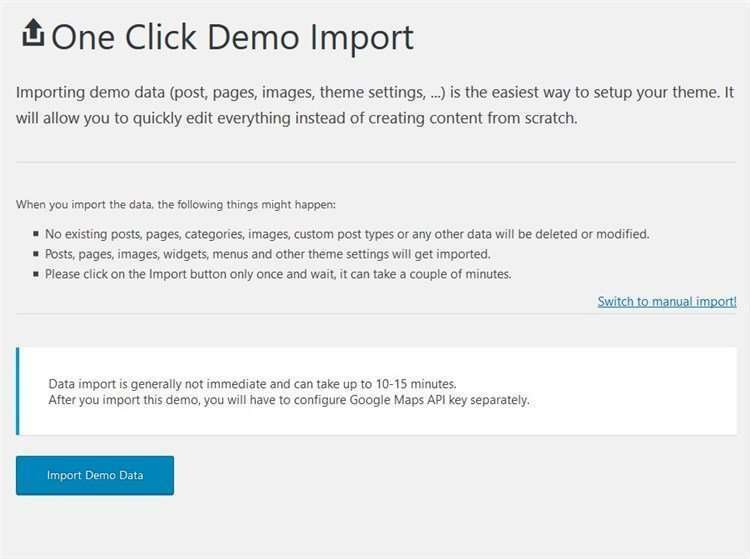 Since we’re using Ciestra, there is a chance to get started easier by importing demo website data in clicks, which makes your website look exactly like in the demo, with less configuration. Then you can simply replace dummy content with custom one. It also does a great job at installing all required plugins and automatically creating system plugin pages, so it certainly simplifies the process even further. If you use a different WordPress hotel theme, you might need to skip this step. Now, let’s take a closer look at the plugin settings. Any custom tags (discount, pet-friendly). Images (the main one and a gallery). Other details, such as capacity (adults, children), size, bed types and view. Any custom info that can be displayed in the property details as well as used as advanced search form fields. You can also control which details need to be displayed on the frontend (e.g. you may optionally exclude non-essential information when featuring a selected accommodation on a dedicated page). If there are any extra services you provide (airport shuttle, babysitting service, bicycle rent, etc. 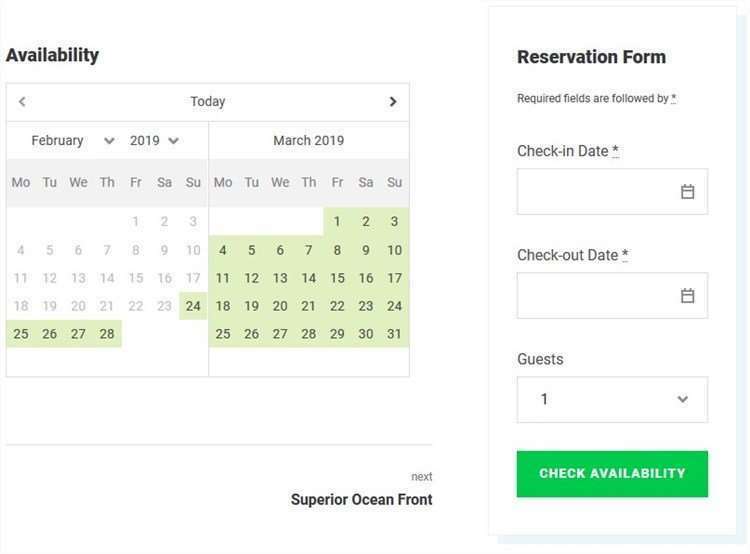 ), you may also tie the needed ones to selected accommodations and allow guests to add them to reservation on the checkout page. By default, the form comes with four fields: check-in / check-out dates and the number of adults / children. If you run a single accommodation website, you can leave only departure and arrival dates. If you use the “Children” field, you can state the age of children. Use a mere “Adults” field or rename it to “Guests”. Include extra custom search fields (location, pet-friendly, etc.). 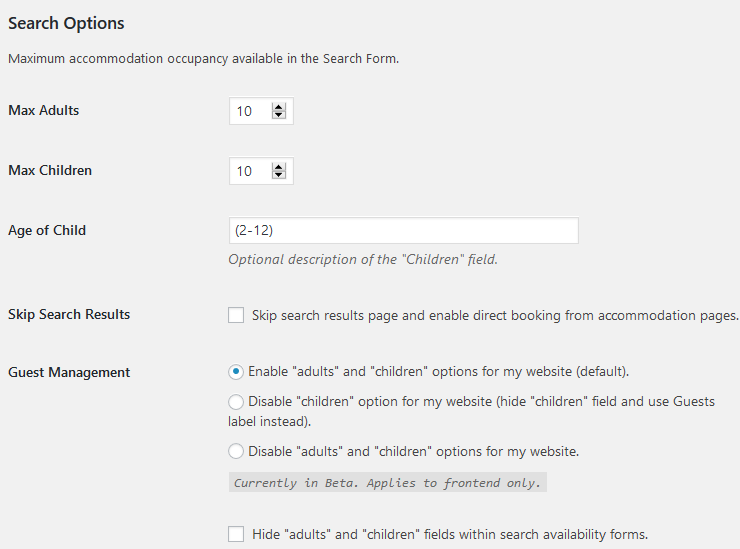 Optionally pre-populate the fields with max and min number for adults and children. Select a calendar skin for the search form to make it consistent with your website design (there are up to 15 color schemes). 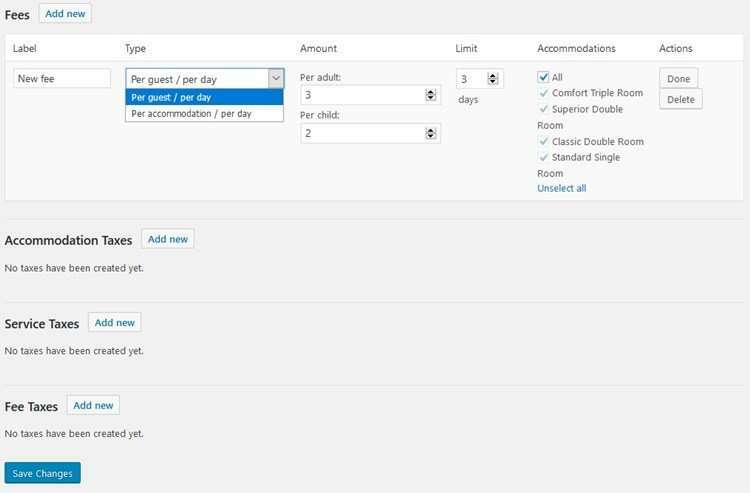 In the plugin settings, you can allow multiple accommodation bookings so that one guest can choose any number of accommodations and book them with one invoice (it’s possible to state different guest names, though). MotoPress Hotel Booking comes with a great tiered pricing system, which you can set up for all properties individually. 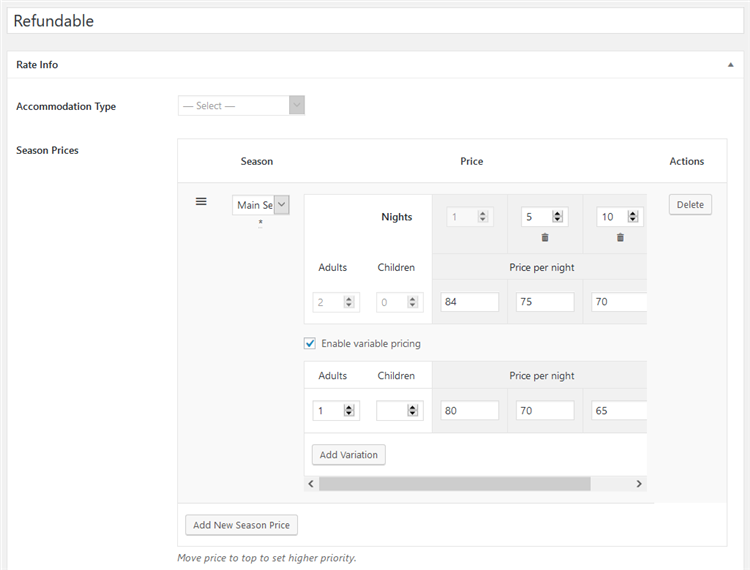 The prices are dynamic so your guests will see a rate that particularly meets their search criteria. Extras: breakfast, refundability, extra amenities, etc. The length of stay (dynamic discounts for a longer stay). To build trust with your loyal clients, you are free to manually create any fixed or percentage discount coupons and grant them to your guests (or promote publicly). 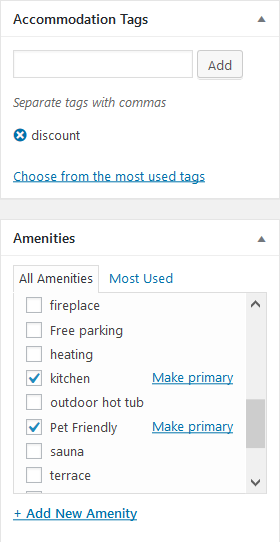 There are tons of settings for custom coupons. 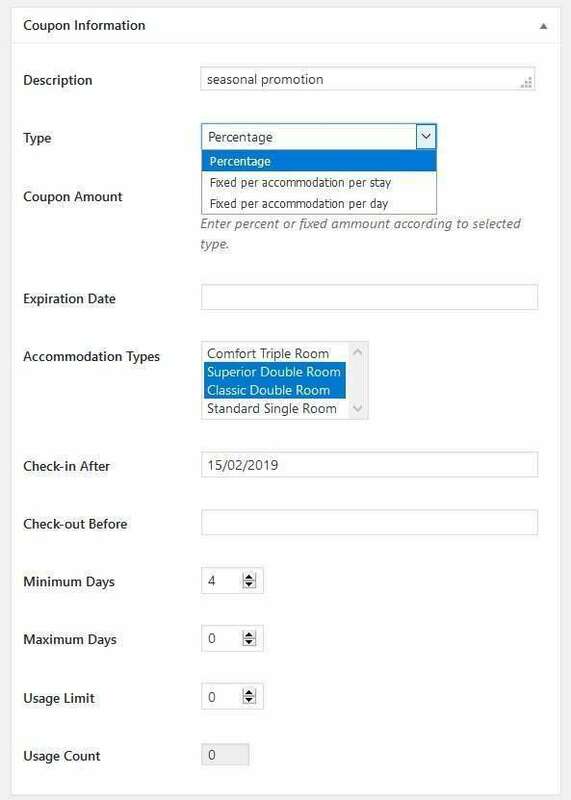 Navigate to the “Booking rules” menu to designate basic availability settings, such as applicable check-in and check-out days, minimum and maximum days to stay. They can vary depending on accommodations and seasons. You can also block availability for selected properties for the needed period of time. If you need to include extra taxes or fees into the final accommodation price, you can easily add them (they can be different for various accommodations). 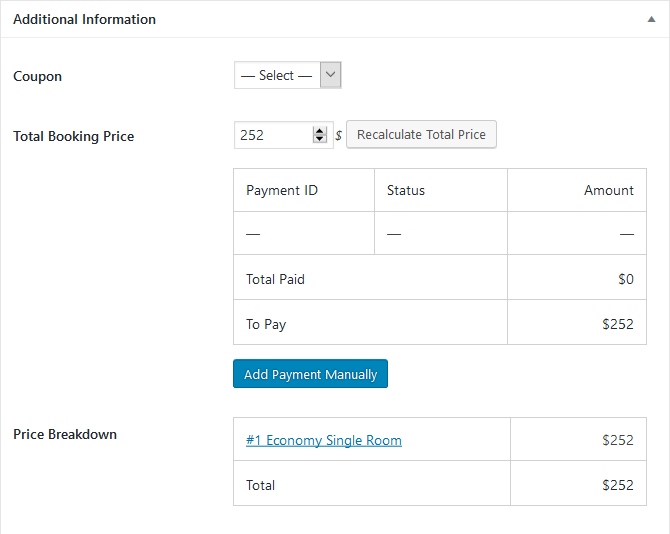 In the checkout, before paying or confirming a booking, guests can see all tax and fee details in the final table of charges. So you need to simply add a block and configure it with a help of toggles. Of course, you can also use the good old Classic editor to edit shortcodes if you wish. Don’t forget that right after activation, the plugin will offer you to create all major system pages automatically, so you’ll have less job to do. Hotel Booking Payment Request – through the medium of this add-on, you can send automated balance due notifications. They enforce guests to pay before arrival in order to secure their bookings. It also tracks all payments through the website and automatically marks fully paid reservations as confirmed. 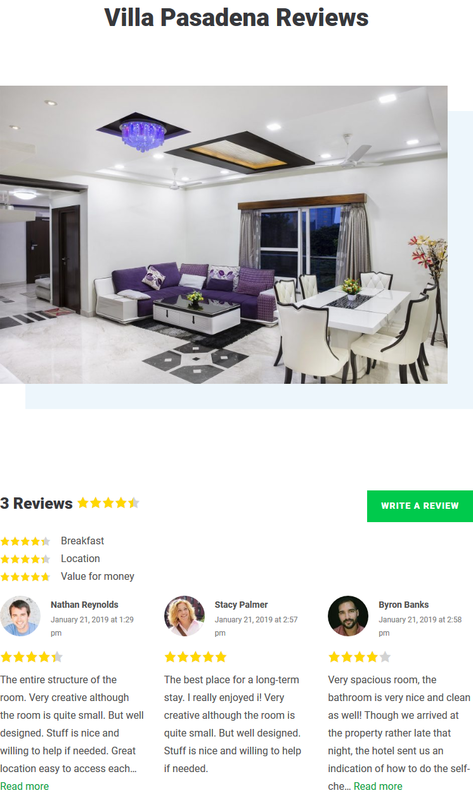 Hotel Booking Reviews add-on enables you to “attach” a five-star property rating system and a feedback form to all accommodation types to allow past guests to leave real reviews. Technically, you can opt out of online bookings and simply create a professional property or hotel WordPress website presentation with this plugin. 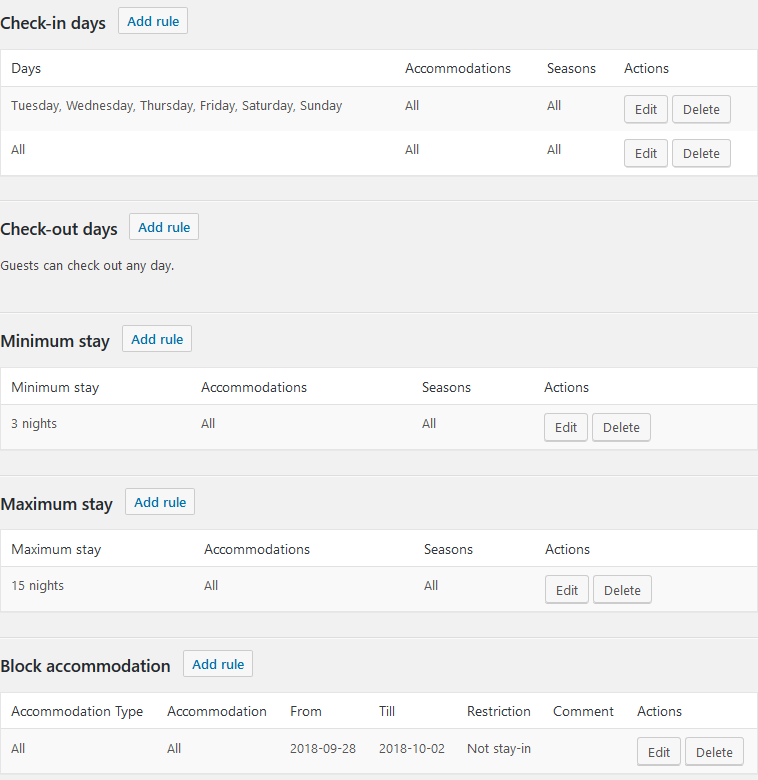 Additionally, you can accept bookings over the phone or email and then add them via admin dashboard manually. Manual booking confirmation by admin. Booking confirmation by guests via confirmation emails. Automatic booking confirmation upon a payment (full or deposit). Without extra expenses, you can turn on PayPal, 2Checkout, Braintree, Stripe and Bambora (formerly Beanstream) to process payments. Guests can also pay only after arrival. 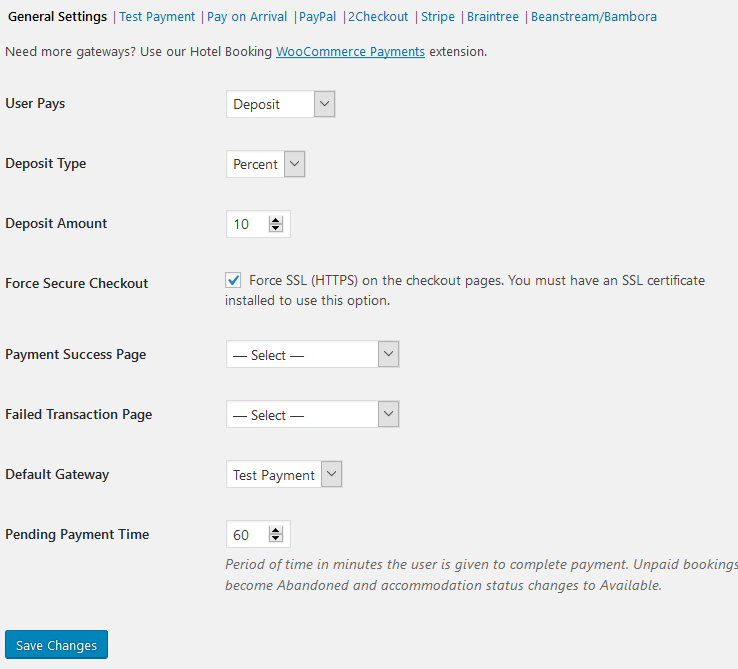 For more payment methods, you’ll need to either code the integration or connect them in clicks via a premium Hotel Booking WooCommerce Payments add-on. In the checkout, guests will be able to choose from the payment gateways you enabled. All processed payments are filed automatically. If a guest paid deposit (fixed or percentage), for example, you can record the remaining sum of money manually after they check in. 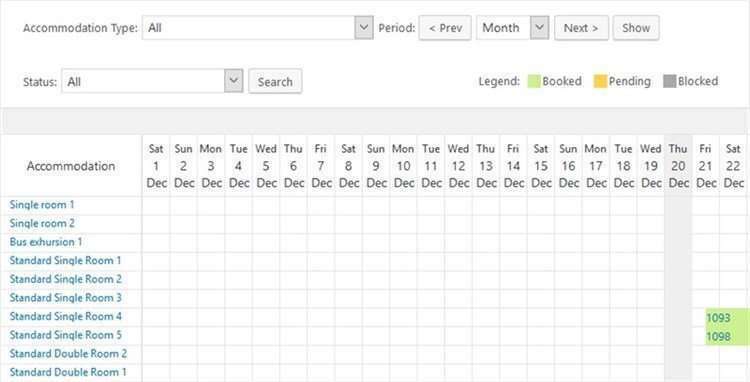 In the admin dashboard, you’ll be able to see all upcoming bookings in a calendar and track payments via the Payment history menu. You can also update guest details or change a booking status. 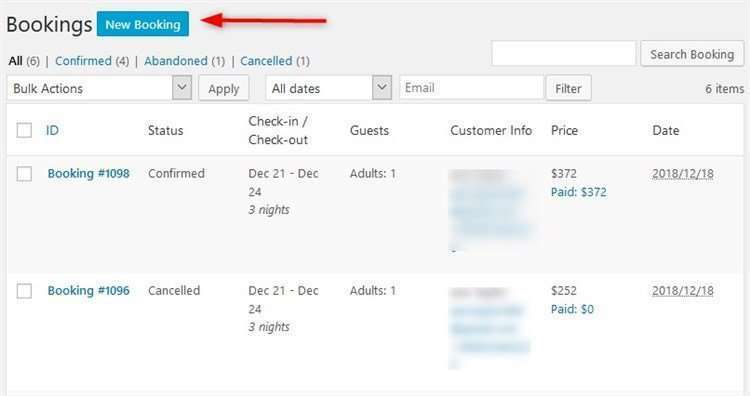 Another great advantage of this WordPress booking plugin is that it lets you automatically synchronize bookings with those you (potentially) accept through travel agents like Airbnb. There is a perfect concierge service, a two-way iCal sync, which makes the connection between your WordPress website and travel marketplaces possible. So, to sync bookings, you’ll need to export and import availability calendars of each property (iCal URLs) between your website and travel agencies. You may need to contact the OTAs you use to make sure that iCal is supported and available in your accounts. If you are interested in details, watch this video guide. And that’s it! Of course, it’s just a bird’s-eye view, but we hope you managed to assess whether the plugin checks all your boxes. Using MotoPress Hotel Booking plugin for WordPress, you can expand your website to foreign audiences or simply get a non-English website up-and-running much quicker. The plugin is available in 14 languages: Portuguese, Polish, Russian, Spanish, Turkish, Swedish, Italian, Hungarian, Czech, Chinese, Dutch, French, Arabic and German. 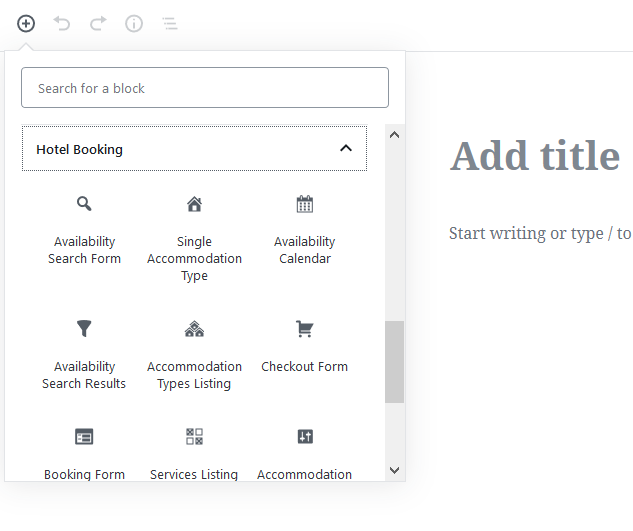 To customize Hotel Booking shortcodes via handy visual editors of Divi and Elementor, there are free conjunction plugins you can install to speed up your workflow: check out Divi and Elementor integration plugins. For WordPress developers who constantly deal with this sort of websites, the Membership program may sound like a more affordable way to start employing the plugin on client websites. You can give a free test-drive to the admin tools of the MotoPress Hotel Booking plugin. 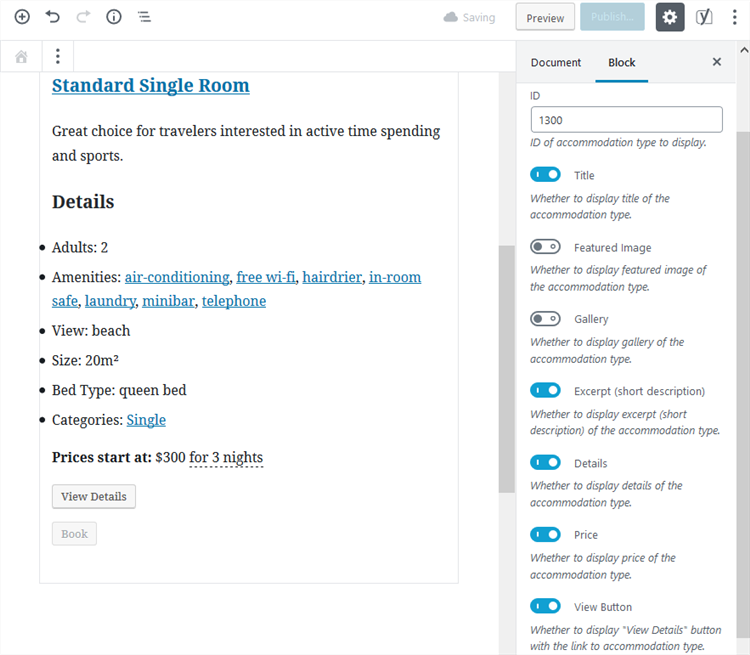 For those of you on a tight budget, Palmeria free Gutenberg hotel theme can be a nice starting point – it’s bundled with a free version of the MotoPress Hotel Booking plugin. A fully-featured property management system. Real-time bookings through your website (plus, offline and after arrival payments). 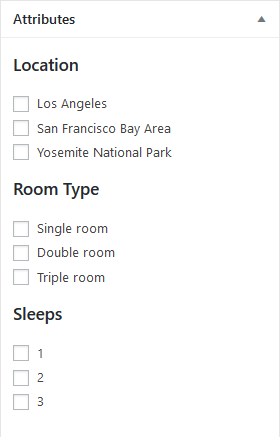 An accommodation search form and availability calendars. Ability to automatically sync bookings to external OTAs that support iCal, and more. So did we manage to create a helpful guide? If something sounds fuzzy, don’t hesitate to ask in the comments. We are keen to keep this conversation going! Ann Taylor is an overall WordPress, open source and dark folk music fan.